U.S. Ambassador to the United Nations Nikki Haley called the resolution "grossly one-sided." U.S. Ambassador to the United Nations Nikki Haley vetoed a Security Council resolution meant to offer "international protection" to Palestinian civilians. 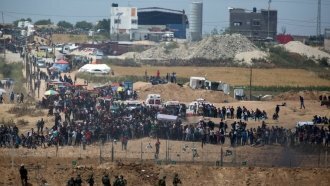 Kuwait introduced the resolution following violence during mass protests along the Israeli-Palestinian border in Gaza in which over 100 Palestinians were killed. Haley called the resolution "grossly one-sided" and said it failed to blame Hamas for inciting the protests. The resolution got 10 of 15 possible votes. Haley said the Security Council had an anti-israel bias. Permanent members of the security council — the U.S., China, France, Russia and the United Kingdom — have the power to veto any "substantive" resolution in the council. Another resolution put forward by the U.S. condemning Hamas for the Gaza violence failed Friday as well. Haley was the only member to vote in favor of that resolution.